The quilt shows come in bursts. Because I have six quilts made over the last 2 years that I show, I am able to send several quilts out at a time. 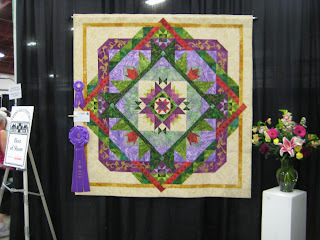 I posted a couple of weeks ago that Zen Garden and Rainbow Nouveau both took 1st place at the Minnesota Quilt Show. I was shocked. Zen Garden is my favorite quilt, but has this insane history of earning honorable mentions. To date, it has earned 4 HMs I think! While I love the quilt, I have become accustomed to not expecting it to win, so this was a moment of pure glee! 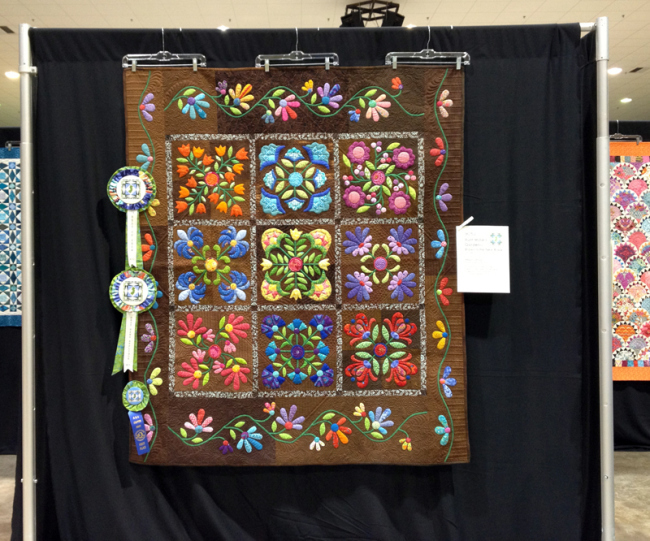 Wednesday evening was the awards for the NQA quilt show in Columbus, OH. I have my 2013 quilts there: Big Bertha and Kaleidoscopic Calamity. Despite no monetary awards, this is a huge quilt show with an incredible talent base. 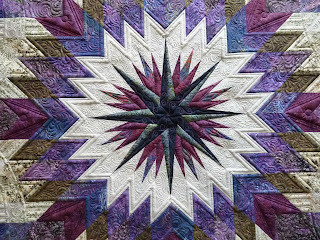 My large quilt, Big Bertha, took a 3rd in the large applique category, and Kaleidoscopic Calamity took 1st in the small pieced category. This was phenomenal news, considering the plethora of big names at this show. My client Jeanette (go back 2 posts) entered 2 quilts, one of which I quilted. Both of her's took honorable mentions. Very wonderful news. Last night was the champagne & chocolate preview for the Vermont Quilt Show. This is the oldest quilt show in New England. I have entered quilts the last 3 years. Though the quilts entered run the gamut of style, it is regarded as fairly traditional. My sense is that the judges here have a definite preference towards the more traditional, even conservative quilts. 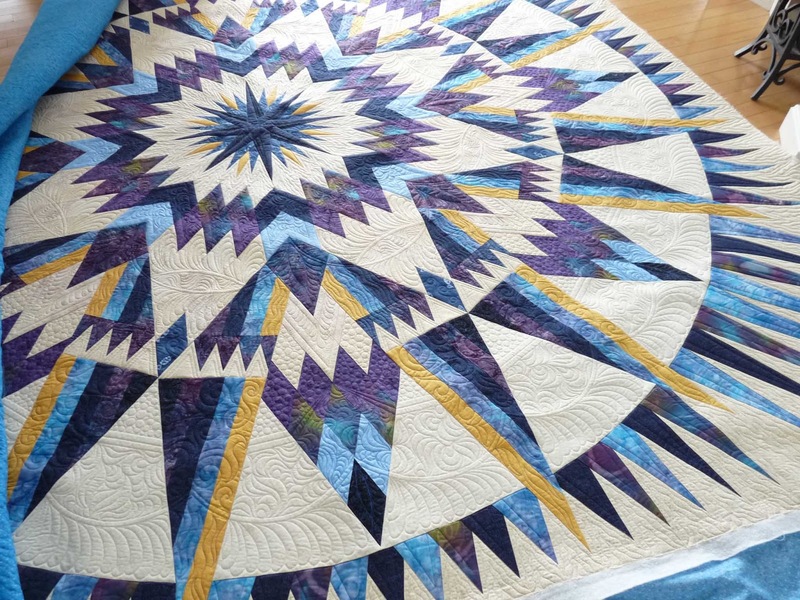 Saying that, one of last year's top winners (not best of show) was Marilyn Badger, and her Superstar quilt is far from conservative or traditional. Knowing that, I expect that the hand quilters will have an edge, and feel like quilts like my Rainbow Nouveau (painted, bold and bright, lots of crystal) may not do as well. It was mostly coincidence that I sent "Meet Me at Giverny" to this show - had to do with timing of when I had quilts available, and the fact that VQF only allows quilts made within the past 15 months. This one squeaked in, barely. Historically, at the shows it has been either hot and well received with the judges, or cold and harshly critiqued. 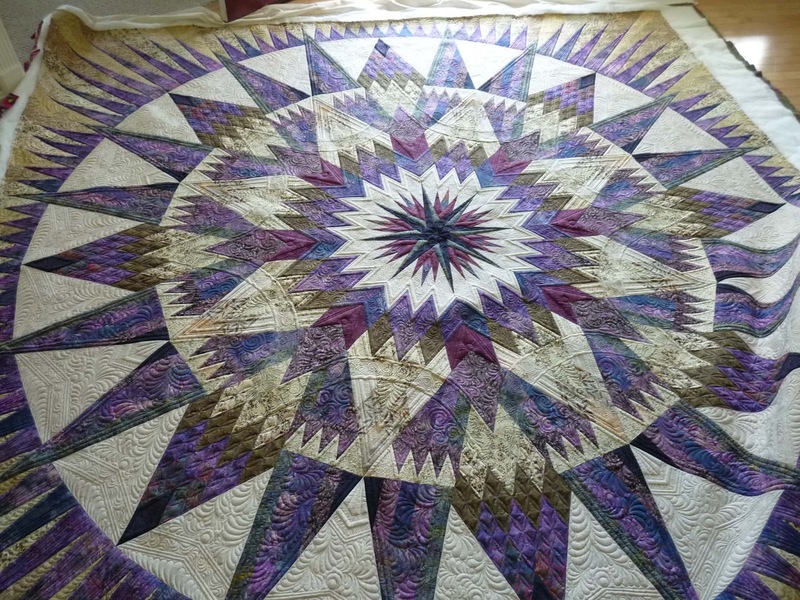 It has earned a couple of 1st place finishes, and even a best machine quilting award at none other than NQA, but then it has been to at least 4 shows that it got nothing. I just never know when I send it out! I caught the trail of news after the awards on facebook last night, and learned that it took Best of Show at VQF. I nearly fell over with shock. Never once saw that coming. Here it is, below, with lovely color-coordinated rosettes, and flowers. I finished up a few quilts this week while my 2 youngest were off at Nana-camp. I have a great lone star to share later this weekend. First off, thank you for the kind and informative comments and emails regarding yesterday's post about show quilting ethics. I am most surprised at the response and the number of page views this post has received -- nearly double my previous highest (ha...even more than the bleeding quilt posts :-))! It's over 750 views right now, and emails/comments keep coming in. I am not, however, completely surprised at the way the professional quilting community at large feels about this. We are a relatively small bunch of quilters that quilt show quilts, and we feel strongly about being recognized for our talents. While I definitely love hearing what each and every one of you thinks on the issue, I really don't think that there is anything I plan to change. It's not a matter of needing it contractually stated that the person having me quilt the top shall do certain things. For the cost of most quilting jobs, there is just no way I will seek legal council should an similar issue like this arise. Is it really a legal issue?? We can all overthink what "we" might do differently to protect ourselves, but in the end, I still don't think that this is a "me" issue. The vast majority of good quilt shows do require the entrant to list the quilter. Those that falsify, if they exist, will be discovered. And as smaller, less experienced shows evolve, they too will require such information. I am confident that I was listed as the quilter, as this show is reputable. I feel strongly that all shows should prominently display the quilter's name on the quilt placard in whatever size font the entrant's name is in. I have been to a few large shows where the quilter's name was in a font so tiny it was barely legible. What is the point in that? I cannot speak for this particular show's signs; I couldn't read it from the photos. My biggest bone to pick was about just not being notified that a lovely quilt which I quilted happened to quilt, took the show's top award. There is no contract that will ensure each and every client will have my degree of interest in each and every quilt touch. That bit comes from within each of us. All I can do is express my sadness for not knowing 3 weeks ago when the show took place, and urge all of us to keep those lines of communication open with our clients. How our quilts do in shows directly affects our business. She may think that this is "her" quilt, but a small piece inside of me still feels it is "part me" too. It is an age-old issue with quilters and quilt shows whether or not "the quilter" should get appropriate credit. 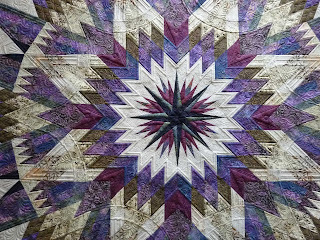 It's not really an issue of whether the quilter should receive appropriate credit, but rather on of IF the quilter is given appropriate credit. 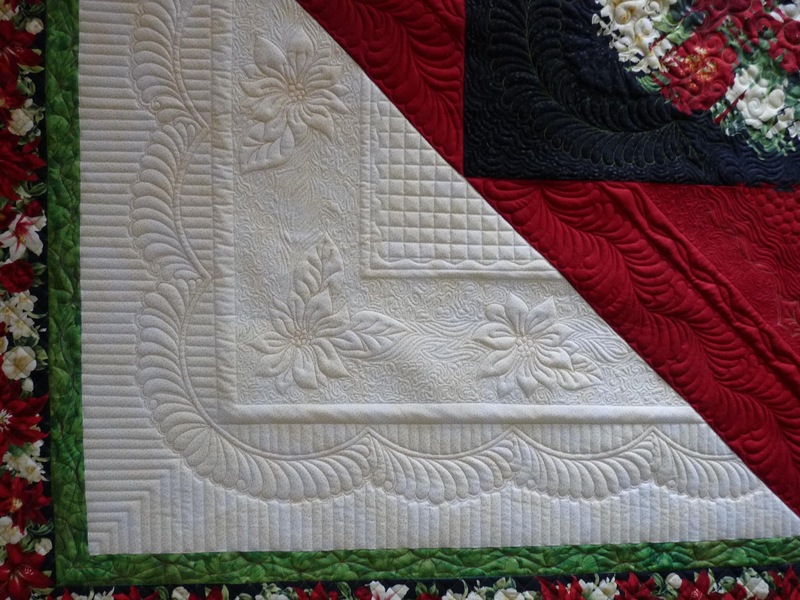 Nowadays, most entry applications for shows request that the entrant provide the name of who quilted the quilt. There are few checks, however, that truly ensure that this is done. 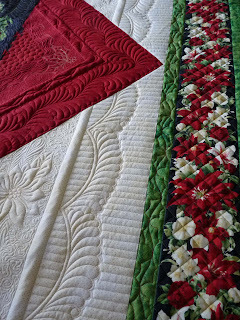 As a longarm quilter, I know in my mind and heart that many quilts are really not a "quilt" until they are quilted. Quilting brings so many dimensions and textures and patterns to a pieced or appliqued top. The quilting becomes the top and makes it a better version of itself. I guarantee that if there were Quilt Top Shows, they wouldn't attract too many viewers. It is the finished package that gets the "oohhs" and "aahhss". So quilters (you notice I didn't call them "quilt top makers"), please appropriately credit your quilter, AND notify them when you show a quilt that they quilted...AND when it wins something. Even though you own the quilt, I assure you they are interested in this news. 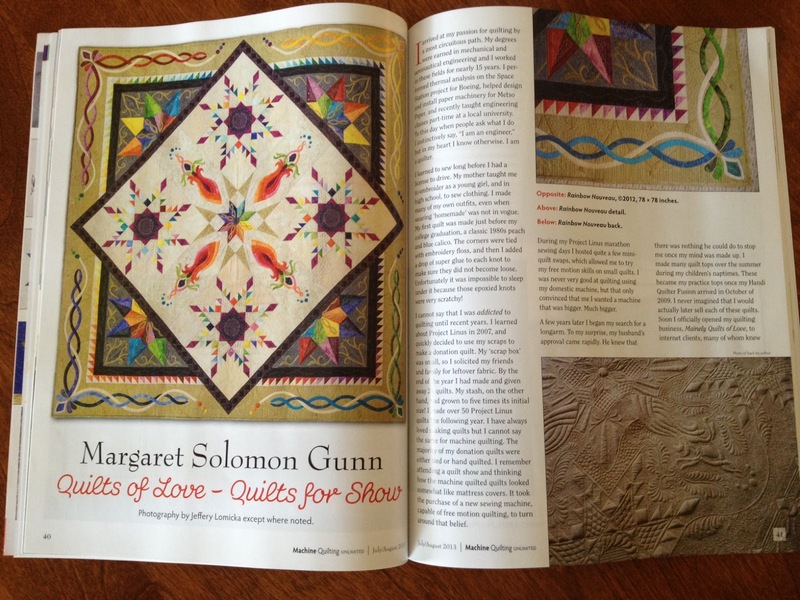 As you now know, I have an article in a current magazine and HandiQuilter ads presently running -- both of which give my website and blog added visibility. Many people will find me, so I am conscious of what I write on account of that. My business is only as good as the image I portray. This blog is much more visible and public than ever before. 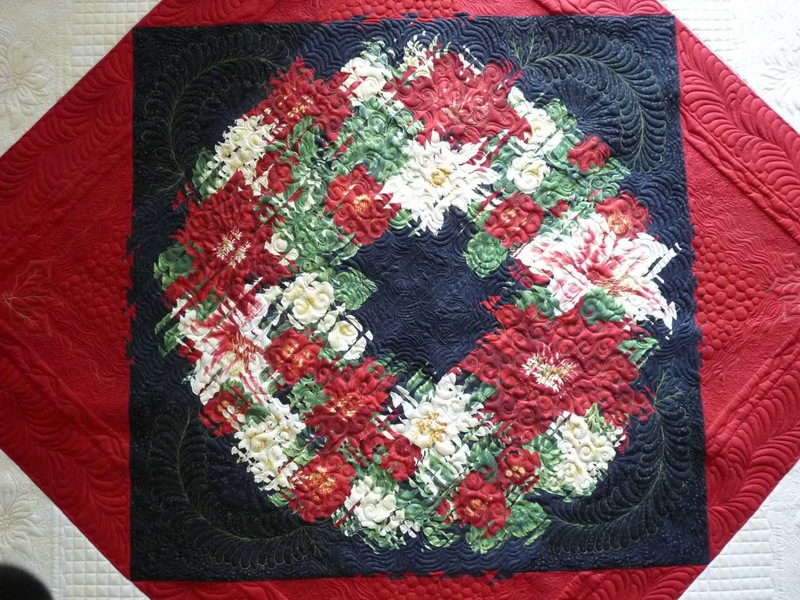 As a result, I generally try to keep my griping to a minimum when I know that the general quilting public and potential clients are reading it, but this is an area that it is just too hard to leave my high-horse behind. It is an area that all quilters should have a vested interest in. Afterall, if the shoe were on the other foot, and I had a piecer that made all of my show quilts for me, and all I did was quilt them, enter them in shows and reap the many ribbons -- dontcha think that the piecer would feel jilted? I do. That is perhaps a slight exaggeration in my case, but not so for many quilters. Over the past week, I have received some wonderful news about a couple of my clients. Do you remember this quilt from last November? Last night I was panning through photos on my computer, and came across pictures of this quilt. When I sent the quilt back to the owner, I never once heard from her about receiving it, or what her thoughts were. It was a seriously gorgeous quilt when I finished with it, really. At the time, I just let it go. While the vast majority of clients are delighted when their quilts return home, there is always that rogue client that says nothing. For months following sending it home, I'd check her blog, but she stopped updating it. Eventually I lost interest and quit checking. Last night, I discovered a new blog she's started. Two weeks ago, her quilt "Aunt Millie's Garden - Brown is the New Black" won Best of Show at the Garden State Quilter's Guild show in NJ! Talk about me being shocked! And a little disappointed that she hadn't told me. It is hard to completely relinquish part-ownership in the quilts that I help to create. I have a vested interest interest in their ultimate successes, and a great desire to hear the news when they do well. As the longarm quilter, I know that the quilts belong to the owner, and what they do with them is their business. I don't have a partnership with the piecers for whom I quilt like some longarm quilters do. These partnerships are relatively rare, but not non-existent. The two people share the ribbons and split whatever earnings the quilt makes equally. I love to share in and revel in their successes, but ultimately, their quilts are theirs once I send them home. All I have ever asked is that the piecer send information about how the quilts do at shows, as it is available. Seems simple enough, right?! Wouldn't you want to know? Last weekend, Jeanette contacted me to tell me that her quilt "Autumn at Lost Mountain" won ribbons at the East Cobb Quilt Guild Show (outside Atlanta, GA). She won 1st place in her category as well as Best Machine Quilting! This is another large guild - probably over 200 members, and a quilt show that hosts many well known names in this business. Needless to say, I was delighted to hear from Jeanette, even more so to hear about the machine quilting award. This one I can claim as mine :-) She has already said that she's sending the dual ribbons and the money from the machine quilting award to me. I am honored and humbled and shocked beyond what words can express about her gesture. She's truly a lady of integrity, and I am proud to quilt for her. 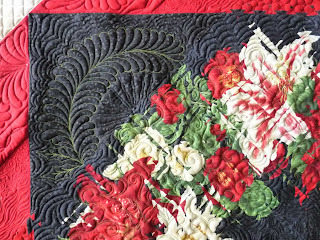 FYI - her quilt is going to be at the NQA show in Columbus, OH this coming weekend too. 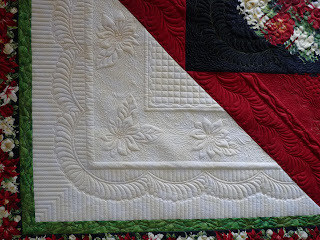 It has donned on me that I never blog posted the quilting of this quilt, so you can see the details of it here on my website. It's lovely! In conclusion, I want to thank these ladies for having the courage to show their quilts. They are both lovely and unique in their own ways. The deserve each of the wins that they achieved. I am delighted to have had a part in creating the piece that they became. I know in my head and heart that after quilting, they are so much more than when they arrived to me as a flimsy. I appreciate knowing where they are now and how they are doing on the show circuit. I encourage each and every one of you that make tops for professional quilters to kindly followup with your quilter when you receive your finished quilt, as well as along it's journey. I assure you he/she really does want to know what ribbons it earns! ...weeks of summer vacation, that is! With the first official day of summer here, finally it feels like summer. It has been a dreary, slow-to-come spring in Maine. Today, however, it is high 80's here. The kids have been out nearly 1 week, and are happily not bored yet. Now, I am a slightly different story <> as I really would like to be quilting. I finished my last large custom quilt on Friday. I won't have another one until the first week of August (all 3 kids will be at Nana camp or soccer camp). Until then, I am doing smaller projects -- instant gratifications, as I call them. Provided I can get 3 kids in a known place for 1-2 hours a day, I can make that work. Easier said than done, sadly. First thing, here's a look at my first magazine cover and feature story! I was so tickled when MQU mag contacted me about doing the article and cover. Zen Garden is like my favorite quilt. It's also taken more Honorable mentions than any other of my quilts (maybe more than all combined!). I am happy to announce that last week at the Minnesota Quilt Show, it brought in a 1st!! My other quilt entered, Rainbow Nouveau, also took a 1st....pretty good showing :-) Anyhow, this is a great 8 page article. Ignore the fact that I still write like an engineer. There are pictures of 5 of my other quilts -- oldies and newer ones. They didn't want to publish ones that they have already published, so there are some older ones in the article. 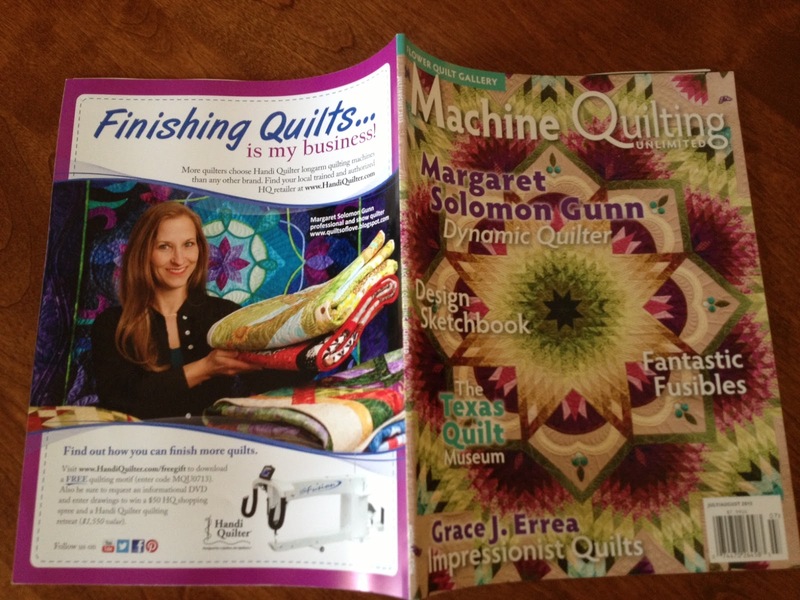 ...And my HandiQuilter ad is on the back of the magazine. Talk about sweet! In the evenings, I am finishing off the center part of this new quilt. I am adding the leaf veins in silk embroidery thread. It needs to be finished before I begin adding the last border and all that applique. 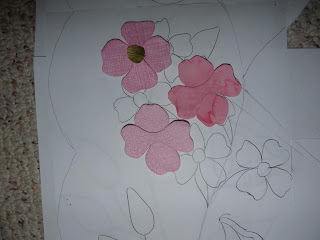 With the kids out of school, I haven't done much but applique preparations. 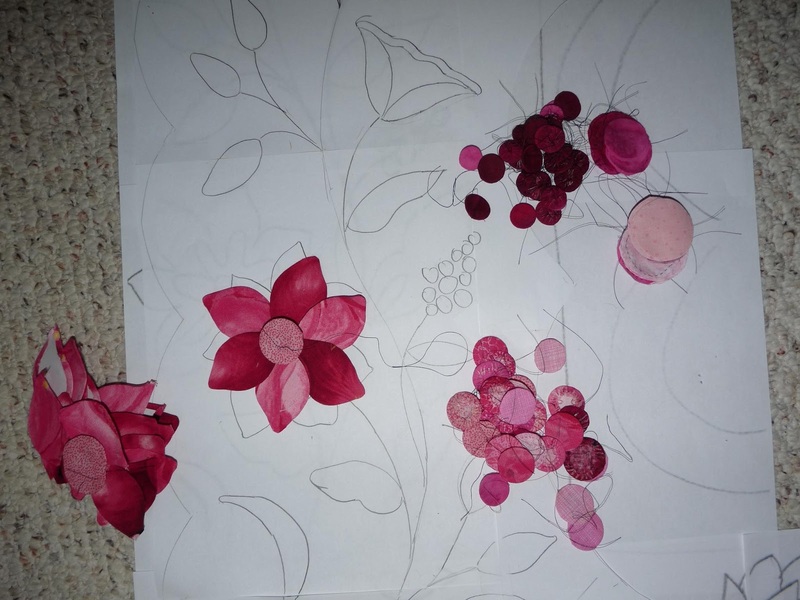 I have many leaves and flowers all with edges turned under/starched. About half of the tiny berries are prepped -- still 36 to go. I haven't done any of the darker toned leaves, but the brighter ones are ready. Today I decided to lay what is finished out on the actual fabrics to see how the tones will look. The serpentine vine isn't there, which will help you to visualize this. The darker leaves and silk ribbon will help it to look better too. I like the variety of small flowers. I will probably assemble the flowers off of the quilt before they are added so that I can better get their shapes correct. This one is sideways for some reason, but it'll be fine. Only 5 of the 15 dogwood blooms are done, but all of the large flowers are in their respective prepped parts. I will have over 200 pieces to hand attach to the quilt - Yikes!! I was hoping to have this one ready to quilt by the early winter. Maybe I am crazy?! Time to sign off and go check on my munchkin playing in the sprinkler. Have a hot week! I've had the pleasure of quilting some Judy Niemeyer quilts this year. 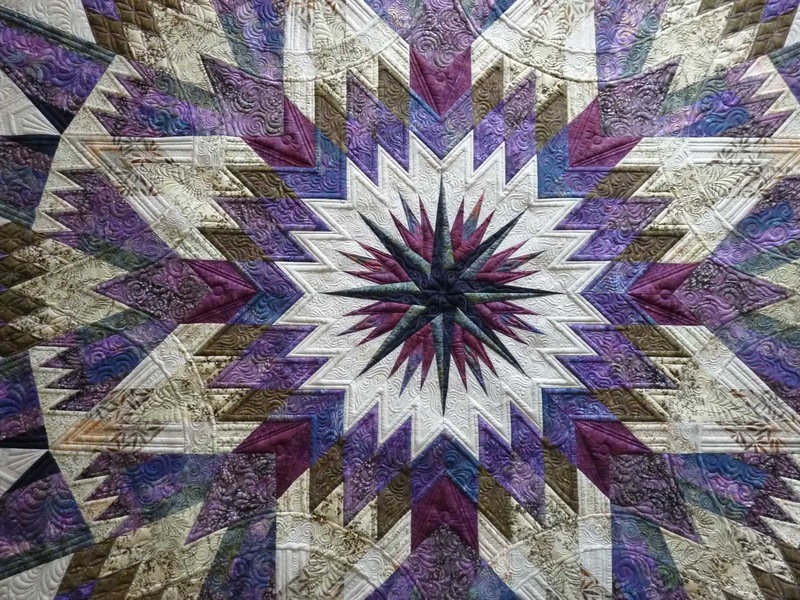 I showed an Feathered Star a couple months ago - a nice sized wall-hanging. I have also quilted two of the Amazon star patterns too. These are 104" square BEHEMOTH quilts. They are paper-pieced. The ladies that did the two in this post took workshops at the Threads Galore Quilt Shop in Rangely, ME. I see the owner Carol each year at quilt shows, and she no longer quilt for clients, so these were referred my way. These two quilts are very different. They are both made mostly from batik, but the color schemes are different. The client's end-use and budgets were vastly different as well, so you can see how a quilt with much more quilting looks. The actual color placement certainly affects the overall look of the quilt. This first Amazon Star was made for the client's bed. It's not a show quilt, and if I remember right, it is her first paper-piecing project. She told me it was hard to select fabrics, and she'd intended it to be more blue. In the end, it has a lot of purple, so I downplayed the purple by using blue thread. The white triangles on this pattern are very large - somewhere around 16-18" long. They require a good bit of quilting, and convey a lot of the design detailing because they are light in color (ie., the quilting really shows here!). This quilt has one layer of Hobbs 80/20 batting. It has two Glide threads - dark blue and ivory. 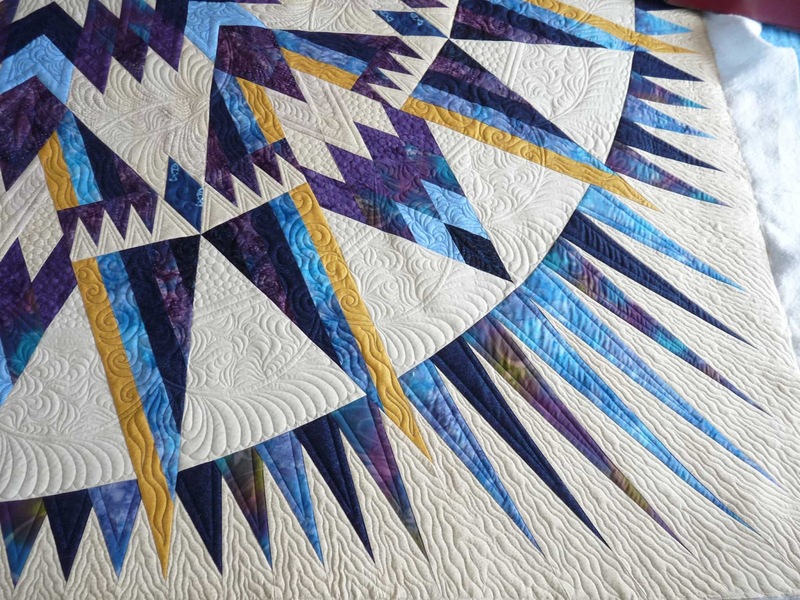 I subdivided the triangles to have a scallop with feathers, an area with a large-ish fill (like a large version of McTavishing...McTavishing would be too dense on this particular quilt, given the client's budget and the fact she only wants it for a bed). There are 136 (I think) spikes around the outermost border. On this quilt, I chose a wavy, ripple-like type quilting for the white and a straightline echo for the colored spike. This is easily stitched in a continuous manner. 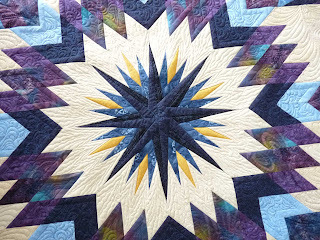 To repeat the border stitching, the ripples were placed around the center star also. Though the quilting on this quilt will appear simpler than the next version, it has a considerable amount of ditch stitching to make all the points crisp, everywhere! It is simpler in it's design and in the density of the quilting. This quilt represents about 25 hours of quilting. I should note right off that this client brought a nice cotton (non-batik) backing, and it worked perfectly with the part-batik top. The next Amazon star was quilted for show. It is denser in it's stitching, and more complicated in design. It is double-batted, Hobbs 80/20 with wool on top. Threads are Glide (gold and ivory) and Superior Omni (magenta). It has an antique feeling to me, given the colors. The center star has a nice shadow-effect that comes from her chosing 2 colors for the main star points. Up close, there really is a massive amount of printing in the background fabrics, but from a distance they settle nicely. This star has a good bit of intermediate designs quilted on the star, intended to appear as texture. There is a curved star that is visible at the inner region. 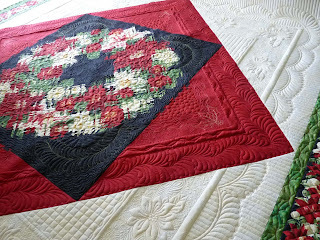 It is lovely to place designs on the quilting that do not coincide with the piecing. It adds a nice dimension to the quilt. I think many quilters fear doing this, but it's really not hard...just requires a little pre-planning to know where that motif will place. Once a quilt of this size is on the frame, it is hard to see where to mark. 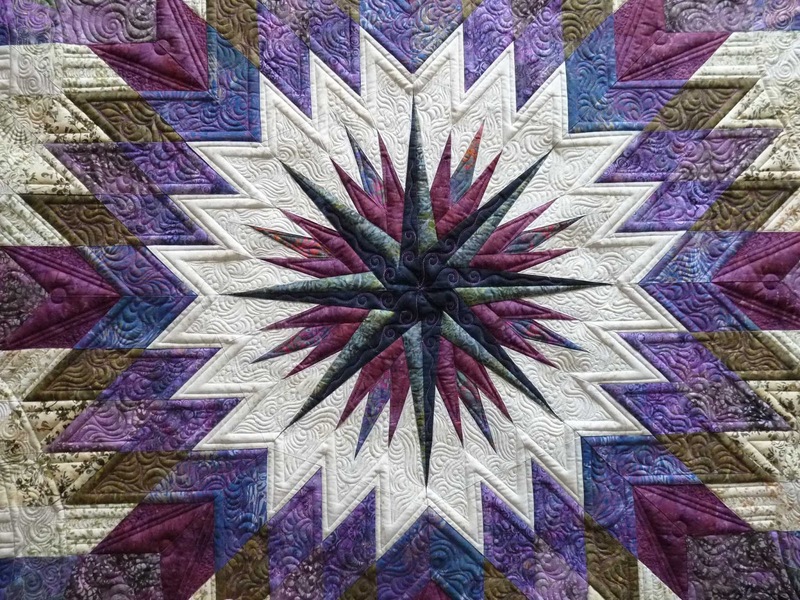 This star I quilted shows in this picture. On this quilt, I did additional echo quilting (ie. double and triple lines to exaggerate/outline certain motifs). Additionally, fills are denser, thereby showing off the linework. 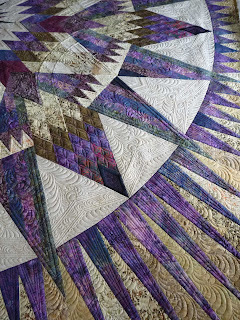 There are still areas with an overall filler used, like these large triangles, but the fillers are more complicated than the first quilt I showed. The curved cross-hatching on diagonal took a while, but looks great. I love feathers, too, because they are rather quick to quilt, but they look wonderful. Even with the feathering in the large triangles, I double-line outlined the points to make them show off. I think the outer border is my favorite though. These free-hand waving feathers look incredible. They quilt fast, but each one is a start and stop. The purple points have additional straight lines to tighten the quilting and exaggerate the point. I spent about 8 hours on the tan background of this border and 3 hours alone on the purple points! Lastly, here is a look at the center. The colors really sing here. It is quite simple...all ditched, outlined and filled densely with a McTavish/pebble fill that I like to use. One feature of these Neimeyer quilts that I have encountered after doing 4 of them this year is that this center star loves to dimple at the middle. I suspect it stems from all the seam allowances, and the fact that it is tough to get this to lay very flat. It's kind of annoying though. This quilt topped in at a whopping ~50 hours. These designs are mentally challenging to quilt. The quilt is huge, and requires a LOT of thread changes. Pieces are so large that it is difficult to get much of the design on the 24" bed of my machine. Also, I can't just ditch the entire quilt, and then go back and stitch out the patterns because of the size of the sections. I quilt this as I go along, changing thread a TON of times. That is true for both versions of the quilt. Hope you enjoy seeing these. Now that this one is done, my Summer will officially start. I have a smocked dress to work on, and many smaller/simpler quilts. With my kids home, a quilt like this would have taken me 2 months! It's no secret. I am always freakishly productive in the early stages of a new quilt. I always seem to lose interest months into it, when things have gone wrong, and I have become disenchanted with the design. I am working rapidly on this new one, trying to get it to a point where it might actually be finished later in the year. Much if the work is done by hand, so that aspect of "when the heck will I piece this" doesn't happen. As you all know, I have been feverishly busy with client quilts, and getting time to piece my own quilts can be a challenge. But I like to be able to settle in the evenings and just hand stitch. It may be slow, but it does eventually get done. Last weekend, I staged this much of the design so that I could get the medallion and 4 corners pinned/basted into place on the borders. This was amazingly trying - the outer border is a print that must meet and match at the same point on all pieces. Of course it needs to be square and centered, etc. Eventually, I pinned the background to the wood floor and tweaked each appliqued piece until all were in the best places possible. I know to most it would seem like stitching the corners on by machine would be simpler, but trust me, I don't think it would have been. There were just too many things to align. In the end, I starched the 1/4" seam allowance to the dark brown border, and just aligned everything with rulers for square and visual for matching the print. This section is about 50" square. A week or so ago, I started on the outer border design, which will have more applique. I found the most perfect fabric for the outer border background while I was at Paducah. If it hadn't been SO perfect, there's NO way I'd have paid what I did for it! It will actually attach to the square above in a wave along where the vine stem is. 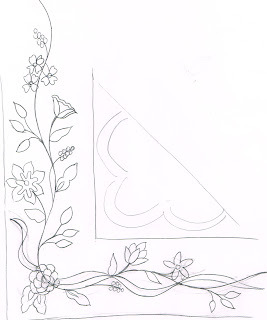 The idea with the applique is that I have mimicked the design of some of the semi-Jacobian styled flowers that are in the ivory print (center dahlia background), as well as bringing more of the floral to the border. I have many pink and green prints that coordinate with the rose inspiration fabric (border of dahlia). 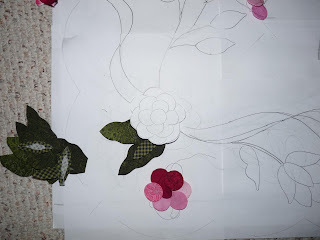 I hope to applique the intertwining ribbon from the Radiance - yup, I know I'm crazy for that one, but it will be beautiful it I can pull it off. At this point, there is still a LOT of applique pieces to prep. Three of the 20 dogwood blooms are done....no leaves or centers though. I have mad a TON of small dots in varying shades of cranberry and rose for these little berry clusters. There are 16 clusters on the borders, requiring about another 100 dots I think! There are 5 or 6 varieties of flowers that hopefully appear to be in various stages of opening. I have 4 (above) all prepared ...sigh! Who would have though that the above flower came from this and this!! I am making some flowers with Karen Kay Buckley's perfect ovals, and some I will prep with the Templar method. I can prep applique until the cows come home when the kids are out of school next Monday. It is easy to bring the iron up from the studio. The sewing machine is another story. Heck, I'll probably even bring a pile of applique to prep when we go on vacation next month! This is a crazy time here for me. I have 7-1/2 days until summer officially starts. 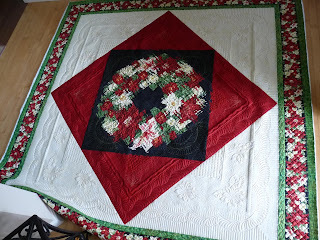 We have been running silly for 4-5 weeks with both of my boys in baseball, so I haven't been quilting or even piecing whatsoever on the weekends. When the depart each morning on the bus, I am trying to be all business. Except when we had 3 days of 90's last week, I did pretty good. I am a sucker for hot temperatures! It's back into the stinking 60's and 70's, so my next quilt should get stitched without hesitation. This is one of Erin's many quilts that have come my way this year. I am not behind, really. I was not supposed to have this done 6 months ago...it's early for this season. It is one of the more challenging quilts I have done for a client. It's 90" square, and has an absolute TON of blank space. Had I gotten this 2 years ago, I know I would have headed for the hills. Now, however, I have some better ideas and instincts for what to put on the empty space. These outer white HST's are 36" on the edge! THAT really is a LOT of blank space to design for. Additionally, the quilting always shows that much more on the white, so I knew it needed to be effective quilting too. I think I rose to the challenge. This quilt has my usual Hobbs 80/20 batting, with a layer of polydown over that. This is a more cost effective means of getting the added loft which is often achieved with wool. It makes the poinsettias appear more like trapunto, and gives great relief to the designs. I also stitched the flowers and the feather swags in a gold shiny Glide thread, so in real life they show a little more as well. The red triangles are about 20", and were fun to design as well. 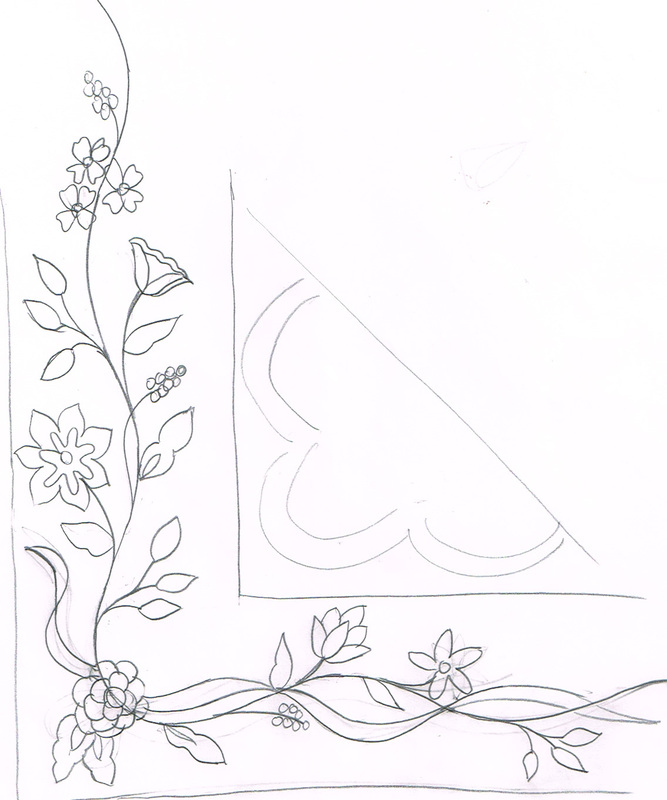 Erin wanted holly, poinsettias, feathers and cross-hatching in her design. Here's a small bit of holly, stitched in the gold, with a ribbon as an accent. The red stitching is all with the Omni thread. I love these feathers! The center wreath was the largest challenge. Nothing stitched on it shows well, and I knew that would be the case. Here's a peek at the outer borders...Believe it or not, that crazy cross-hatch border took me the longest of anything on the quilt. It was a meticulous treatment, with a lot of marking to keep the hatchings even. 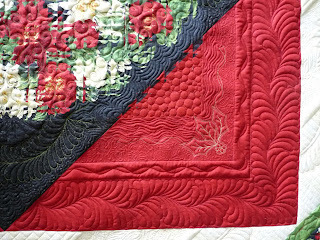 The narrow holly border is all freehand, as is all my quilting, and is stitched with a red Glide thread.